Our large Charcuterie hamper is bountiful enough for eight people. It contains three types of pate, two kinds of Saucisson, cornichon, Dijon mustard, black and green olives, mini toast, apples and pears. 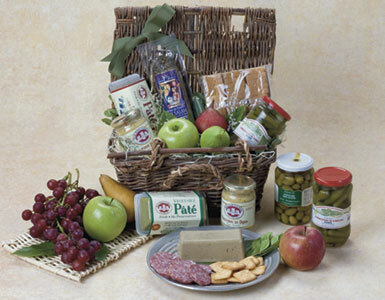 We specialize in picnic baskets including pate gift baskets, antipasto baskets, Charcuterie baskets, salami gift baskets, sausage gift baskets, and Saucisson gift baskets. We promptly deliver your gourmet picnic basket and gifts to your home or office in Beverly Hills, West Hollywood, Santa Monica and greater Los Angeles area.